Ur Birthday Wn U Nvr Look any Older"
☻Wife: where ‘ll you take me on our 10th anniversary? Husband: We’ll go to African jungle safari. Wife: Nice. And on our 25th anniversary? Husband: I’ll bring you back. He didn't pay the dues, the bank took away his car. I'd have taken a loan for my marriage also! Good night mother of my 3 kids. Wife Replied: Good night father of none. A boy got Job in Girls Hostel! After 1 month.. Warden: Why didn't u come 2 take ur Salary? Boy: (SHOCKED!!) Kya?!! Paise bhi milenge..??? Raat me saare kapde utaar k soya karo > > > > > > > > > > > Mera matlab Rassi se . Q ki Baarish ka kuch pata nhi hota Kab aa jaye . Girl to Ramdev-if i kiss a boy to kya hoga? Baba- narak mein jaogi. Grl-Acha agar ap ko kiss karun toh? Baba-chalak ladki swarg mein jana chahti hai. Zindagi Me Hamesha 1 Baat Yaad Rakho, Kabhi Kisi ka DiL Nhi Todna Chahiye Qki DiL Ek Hi Hota Hai . . . . . . Todna Hai To Saale ki Haddiya Todo 206 Hoti Hai. Gud frnds should be like 2 zeros(0,0) When u try 2 add they r same, when u try subtract they r again same. But when u try 2 divide they r "undivisible"
FrIeNdS r LiKe StReeT Li8 aLoNg d RoAd, DeY dNt MaKe D dIsTaNcE Ne ShOrTeR.. bUt.. DeY Li8 Up d PaTh n MaKe d WaLk WoRtHwHiLe.. Hv A gUd BeGiNiNg Of NeW WeeK..! Kitni gehri dosti karte he aapse, kaash aapko b kabhi ehsaas ho jaye. par aisa na ho k aap hosh me tab aaye jab hum gehri nind me so jaye. Fashion is simplicity 4 us. Class is meeting hall 4 us. Teachers are inspectors 4 us. Girls r dolls. Guys r prince. Cafe means life 2 us. Study is our part time hobby. Campus roads r catwalk tracks. We know how to laugh after short attendance & poor grades. We are "STuDNTS" Keep Rocking Buddies!! Agar aapko koi bhi anjan PARCEL mile to kripiya use na khole usme... RAKHI ho sakti hai Apki jara si laparvahi apko Bhai bana sakti Hai.. Janhit mai jari. Rakhi Ko Tyonhar Tha, Rakhi Bandhane Ko Bhai Taiyar Tha, Bhai Bola bahna meri ab to rakhi bandh do,Bahna Boli, Kalai Peechhe karo, Pahale Rupae Hazaar do. Sister is someone who is caring and sharing. Sister can understand things you never said. She can understand pain which is not visible to anyone. I love my sister. You know that you are the most precious stone in the collection of my secret treasure, Wishing you very very Happy Rakhi. Flowers die, Stories End, Songs Fade, Memories are forgotten, All things come to End, But, "Precious People" Like "You" Are always remembered. What is a Girl Friend? Ans: Addition of Problem, Substraction of Money, Multiplication of Enemy, Division of Friends.... So be careful. Luck is like sand in hands.It will Luck is like sand in hands. It will sneak out through the fingers, no matter gripped firmly or held loosely. Only hands in the praying posture can save it. A special smile a special face, A special someone no one can replace. I love you and always will, You've filled a space no one could fill. and express profound sorrow and condolences for you and your family. We are deeply saddened by his death. We send our condolences to the Mzimela family. He will be given a full departmental funeral. and our friends in Germany who made up most of the passengers. I have also conveyed my condolences to German Chancellor Gerhard Schroeder. 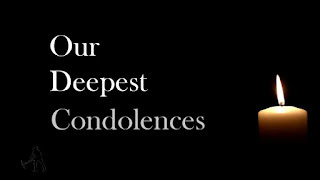 share my deepest condolences and grief on this moment. May the lord bless her the peace in heaven. convey my regards to one and all in the family. (”( Ö, )”) * . * .